You are here: Home / Blog / PeeDar News & Tips / What Batteries Are Best For My PeeDar UV Flashlight? You’ve just bought your brand new PeeDar and are starting to instantly discover loads of previously invisible stains, but perhaps you’re wondering if there are more powerful, longer lasting batteries that could help you spot even more. Batteries are a key part of your PeeDar UV flashlight, they hugely impact the strength and consistency of emitted ultra violet light. The more UV output the better and easier stains are to spot, but with the massive range of batteries out there what exactly are the best ones to use? 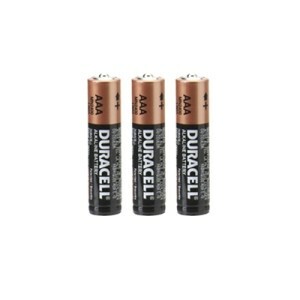 standard AAA – 3 are required, fitted snugly into the battery caddy. 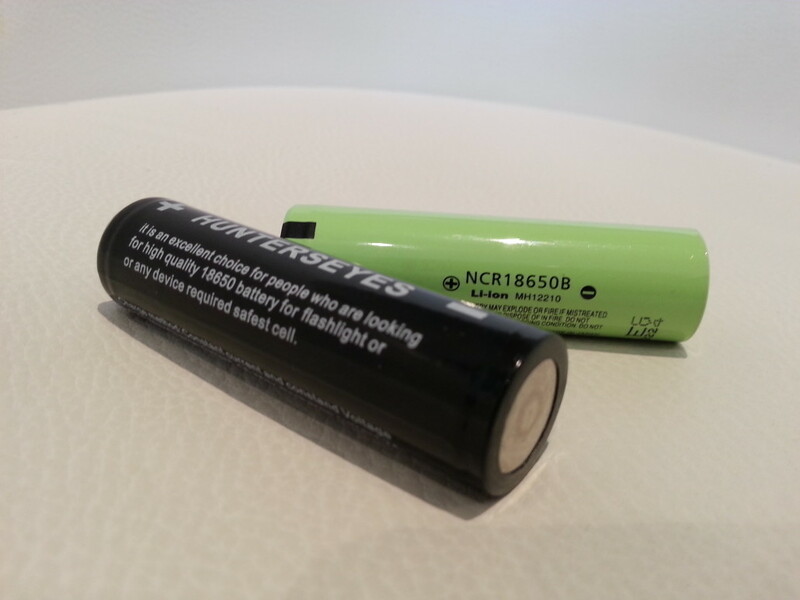 18650 – one single battery will work in the PeeDar 2.0 only, not the original PeeDar! You’ll need to remove the battery caddy completely, then carefully place the 18650 into the empty flashlight barrel. Please note, due to this flashlight not being built to accommodate this size of battery, the head spring is bent severely, this could slowly weaken the spring over a fairly long period (i.e. years) time. Pros – strong initial power output, stores well (5-7 Yr.’s), moderate price, widely available. Cons – whilst in use its energy output reduces. Expensive in the long run due to constant replacement. Pros – exceptional energy storage, the best size-for-size. Superior for working in extreme temperatures, hot or sub-zero. Amongst the longest storage time of all, 10-15 Yr.’s. Cons – so powerful it can sometimes fry circuitry – can be risky to try with some UV LED flashlights. Expensive to buy and will eventually need replacing. Cons – shortest life of any battery, will need replacing often. Poor for extended use, especially with outdoor devices. Amongst the shortest shelf life, 3-5 Yr.’s. Pros – discharges energy at a highly constant rate. Also works in higher-drain devices. Performs quite well in cold conditions. Better long-term value than single use batteries. Better for the environment due to lower toxicity chemicals being present than cadmium-based batteries. Recyclable. Cons – initially high expense. Discharges its power relatively fast when not in use. Longevity reduced if stored in warmer conditions. Needs an initial charge before first use, and if left unused at least one charge every 1-2 months. Can’t be charged as many times as NiCd batteries. Energy capacity reduces by 1-15% after 100+ recharges. Dropping, or rough handling, can damage and reduce performance. 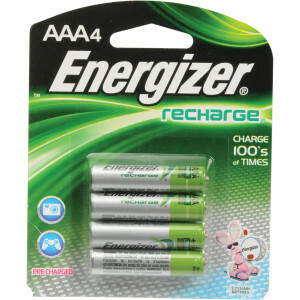 Performs best when used in a ‘smart charger’ specifically designed for NiMH batteries. Less efficient in low-drain devices such as UV flashlights. Pros – Same as NiMH batteries (see above). Also, can use immediately after purchase. Much reduced loss of energy (self-discharge rate) when not in use, therefore good in infrequently used devices. Cons – moderate initial expense. Can’t be recharged as many times as NiCd batteries. 10-15% energy reduction after 100-300 recharges. Pros – less expensive than NiMH batteries. Can be recharged a higher number of times than NiMH batteries. Very rugged, not easily damaged. Moderate self-discharge rate of around 20% per month. Cons – often has less than 50% the energy capacity of most NiMH batteries. Bad for the environment, due to toxic cadmium. Suffer from ‘memory effect’, whereby if you don’t wait for all energy to be used up before recharging, after recharging the battery can only output the energy that was put in in the last recharge. Pros – lowest self-discharge rate of any rechargeable battery type, less than 10% per month. Considered impossible to overcharge, you can recharge at any time. Cons – not widely available in cylindrical shapes (required to fit inside PeeDars). Quite expensive. If left unused its performance is hindered by age. Although not vital, it is best to recharge before all battery energy is used up. Cons – lowest number of possible recharges, no more than 10-50 max. Relatively expensive. 1. 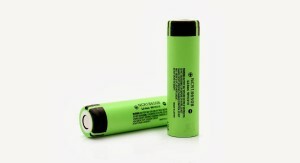 Rechargeable – Lithium-ion – AAA or 18650 (pictured below) – so far we’ve not experienced any issues with this type of battery in our PeeDars, we’ll update this post if we do! Superior power storage, amazingly constant power output (minimal gradual decline in UV output whilst in use), top power to weight ratio, low (<2% per month) self-discharge rate, rechargeable, and works in a huge range of temperatures. Although initially expensive, not rugged, and best being frequently used and recharged, with recharging occurring before complete energy discharge, we think their performance is worth it. 2. 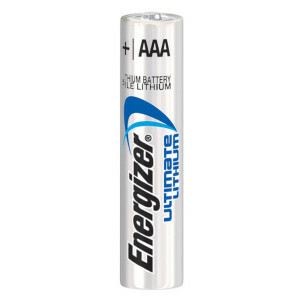 Single Use – Alkaline – AAA – Although not rechargeable, these are the batteries your PeeDar were designed to use, you can find them in most places, they’re a good price, and they fit into the caddy snugly and work very well. 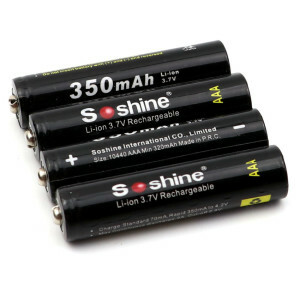 Well known brands create very high quality batteries, with strong power outputs, they have very low maintenance requirements and store well for a long time. Extreme temperatures unfortunately reduce their performance quite a bit, this type of battery also outputs gradually less power as it is used. For all the other types of batteries we see potential issues. 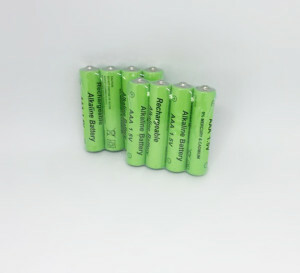 NiMH and Lithium batteries are so powerful they may well fry the low drain PeeDar circuitry, these batteries are more ideal for high drain devices such as cell phones, digital cameras and remote control toys. Although not vital, to best preserve the performance of NiMH batteries you should recharge them as soon as their remaining energy reaches 30-50% of their max capacity. NiMH specific battery rechargers are also a requirement. Pre-charged and standard NiMH batterys also have a higher self-discharge rate of 20%/6 months and 40%/month. 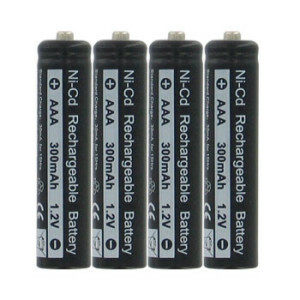 Heavy Duty, General Purpose, NiCd rechargeable and Alkaline rechargeables are all very low value options for your money spent, either not having much energy output to start with, losing all their energy fast, and in the case of the rechargeables, having a very low limit on the number of times they can be recharged. 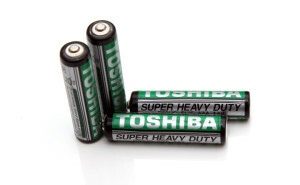 These batteries also contain the most toxic substances, especially bad for the environment if not recycled. As battery technology is constantly improving we’ll be sure to update this article with the latest findings. I hope this information is a big help, and do let us know if you have any questions! After ordering from Chewys.com, I have been using my PEEDAR 2.0 for about 3 months. At 1st, it was incredibly powerful. I haven’t used it for a while, so found the light with barely an brightness at all. 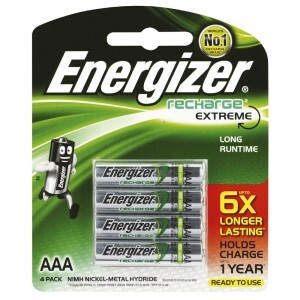 I have tried 2 different brands of batteries, to no avail. I cannot get a bright enough light from the PEEDAR yo see anything at all; it is showing only a very, very dim light; same as it did before changing the batteries. Help! 1 – unscrew both the head and tail ends. Remove any rubber rings that are present. With a fresh piece of tissue paper, softly wipe away any grease or dirt from the metal threading. Be careful here to watch out for tiny metal spurs on the threading that may grab on to the tissue, or cut through the tissue! Work around these spurs if you see or lightly feel any. Be slow and thorough. 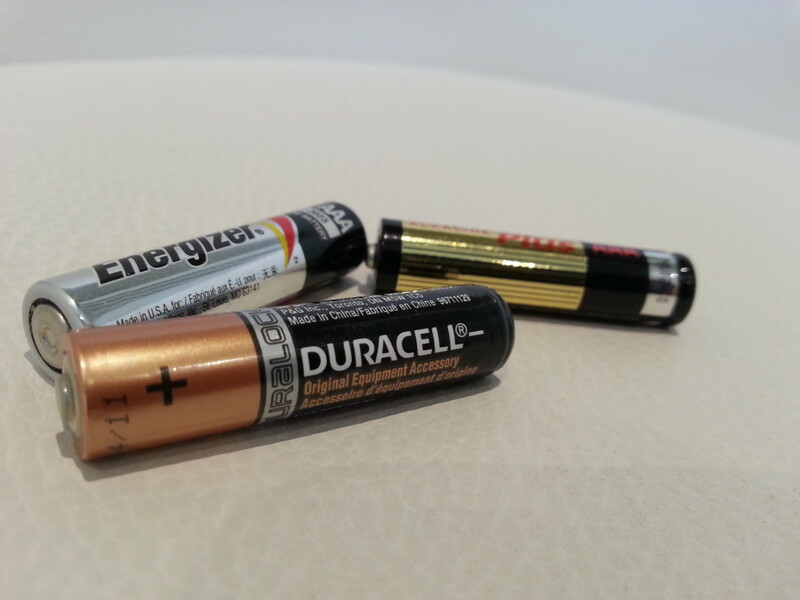 2 – fully remove, all 3 batteries from your battery caddy. Make sure these batteries are brand new, or fairly new, i.e. have more-or-less full power output. 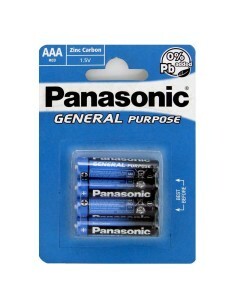 Check if there is any grease at either end of each of the batteries. If there is, wipe it away with another fresh piece of tissue paper. 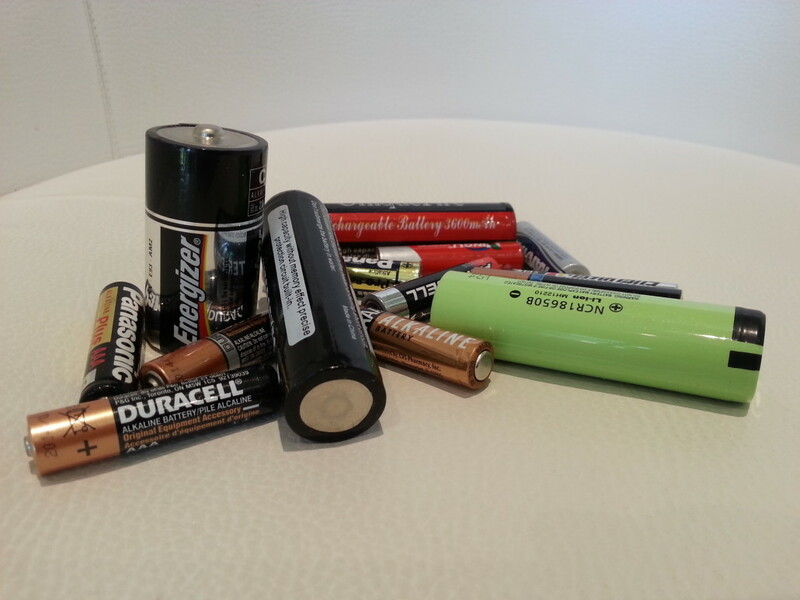 3 – place your new/just-used batteries correctly into your clean caddy. We have a blog post on this if you want to make sure! 4 – Leaving any rubber rings aside, screw on the head slowly and firmly, then unscrew it completely. Perform this action twice more, and during the last screw on add a bit of extra force to ensure the strongest reasonable connection. 5 – Place your full battery caddy into the shaft of your torch, then repeat step 4 with the tail end. 6 – with your cleaner PeeDar 2.0 firmly back in one piece, aim it 1cm from a piece of white paper and rapidly click on and off around 5 times, then with a further click leave it on. Check all LEDs are on fully with no dimming or flickering, i.e. each LED will provide a constant and strong similar light blue spot on the white paper. Shake the flashlight briefly, click a few more times, leave on and shake briefly to see if any output problems exist. If you’re confident that the issues are solved switch off your flashlight! 7 – If there is still a dim light issue, or new issues such as flickering, repeat the last steps 1-6 with the addition of using a tiny amount of soap or fairy liquid on your tissue for cleaning the metal head and tail threading. When using cleaning liquids be sure to try and remove most, if not all, of these chemicals with a bit of water and new tissue before screwing the torch back together! Screw points should be clean and clear of debris. I use this exact set of steps every time I see any light issues during quality control, it’s fast and effective. If after redoing steps 1-6 your lighting issues persist then there could well be a connection issue that is much more complex to try and discover and rectify (e.g. a problem with the head’s circuitry, caddy connectivity issues, clicker issues). In this case, simply contact us, and we can discuss a replacement!